Jimmy Carr is one of my favorite comedy writers. He’s also not someone I would recommend for anyone without a firm warning. Over his nearly 20 year career in comedy, Carr has become an international success by carving the cruelest of ideas into perfect bite-sized bits. His latest special The Best of Ultimate Gold Greatest Hits collects his favorite jokes from across his career, packages in a few new ones, and dares the audience to laugh. There are hundreds of jokes in this 57-minute special, taking the form of one-liners, callbacks, and crowd work. When a bit is too dark Carr joins in on the laughter with his mockingbird-like cackle. Carr’s laugh is a genuinely haunting thing, a disingenuous mocking pop that almost works like a joke tag when it appears. If we ever allowed a British person to play the Joker, Jimmy Carr’s audition would probably be blood-chilling. One running piece of crowd work involves a bit about how Carr slept with the mother of a teenager in the front row. It starts with one brutal aside, “I still owe her 20 euro. That’s right, I paid for everyone,” and continues through the hour. At one point a heckler in the back row even gets a dig in on Shane’s theoretical mother. On a schoolyard, it’d be cruel, but inside the show, it’s not. The audience has accepted the difference between performance and reality, and Shane has his dad next to him for comfort. The closest American comparison to Carr is Anthony Jeselnik, another brilliant artist with a gift for efficiently mining pain for comedy gold. Each is uniquely a product of their country of origin. While Jeselnik’s darkness is a reflection of American apathy and cultural nihilism, Carr similarly parodies Britains’ veneer of propriety. For all his elegant styling and careful language, he revels in cruelty, insults, death, and selfishness. Our two countries have similar historical crimes, but the British have always had a way of seeming above it all. While Jeselnik dares you to look, Carr puts an extra coat of polish on his atrocities and proudly displays them. His greatest strength is delivery, treating his jokes with alternating pride, outrage, and sheepishness. He lets some bits hang in the air with a gleeful smile, while others he immediately tags to keep the laughter rolling before anger can spark. “I was reading the side of the box of Viagra they sold me. And it said on the side of the box, ‘keep away from children.’ I thought what kind of man do they think I am? That can’t maintain an erection with a child!” When groans punctuate the loud laughter, he responds, “well that joke really separated the men from the boys. Somewhat ironically,” before unleashing his hellish bird laugh. Carr’s act is one of the best examples of why consent matters between a performer and their audience in comedy. One thing that’s sometimes lost in conversations about safe spaces is that they exist to protect audiences and free speech alike. There’s a place in the world for hurtful, cruel, vicious jokes. It’s just when they’re shared willy-nilly, without warning to the people experiencing them, that they become a problem. 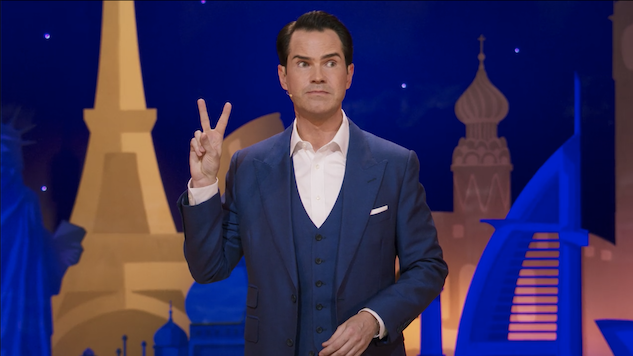 No one comes to a Jimmy Carr show without knowing what they’re getting into, and the gradual pace of how his evil escalates gives most people enough time to know when to leave. The Best of Ultimate Gold Hits is a profoundly evil, brilliantly written hour of comedy. Drawing from years of material, that shouldn’t be surprising. What might surprise you is that underneath the shock is how even-handed the material is. Carr equally shits on everyone, including himself. Unlike the countless “truth teller” comedians out there, Carr isn’t trying to tell you anything about his reality. He’s creating a world of giggles from real life crime, suffering, monsters, disability, race, language, privilege, and Shane’s mom. His very character is steeped in privilege, a man with perfect hair and a thousand dollar suit holding court with his horrors. But he never tries to make you think he’s right. For one brief moment, you worry he’s about to go on a rant about PC culture and how it’s ruining comedy. Then he uses it as an excuse to discuss his own imaginary crimes, and you can breathe a little easier. We live in a time where millionaires regularly make lazy hack jokes about how triggering their act is for an audience of imaginary snowflakes. Jimmy Carr doesn’t try to market himself as shocking, because he’s not worried about what you think. He only wants to give you the Ultimate Gold Hits, and by God he delivers. The Best of Ultimate Gold Hits is now streaming on Netflix.